L'Ecurie is part of a beautifully restored farmhouse located on the outskirts of the village of le Pouzat in the rural heart of sunny Charente Maritime. Tastefully restored, L'Ecurie is only ten minutes drive from the lovely, old town of St Jean D'Angely, and provides comfortable accommodation for up to 4 people, sharing a large pool with 2 other gites. The farmhouse has a roomy open-plan kitchen/dining/sitting room with washing machine, dishwasher, fridge/freezer, gas hob and oven, tv/dvd player and comfortable sofa. There is a double master bedroom with ensuite shower room, wash basin and wc. The second bedroom sleeps two and has an ensuite bathroom, wash basin and bath.The double master bedroom has ensuite shower room, wash basin, wc. The second bedroom sleeps 2 and has an ensuite bathroom, wash basin, wc. Location: The property is ideally situated for a wide range of leisure activities and site-seeing opportunities, but also for a family holiday, with beaches and other facilities within easy reach. The gite is around 40 mins from beautiful beaches, including the lovely Royan. La Rochelle, is unmissable for shopping, dining and visiting the state of the art Aquarium. The area is rich in Roman art with historic churches, villages and towns. Cognac, home to the famous cognac houses of Martell, Hennessy and Reme Martin, as well as an 18 hole golf course and boating, is in easy reach. Angouleme the major town of Charente is only 45 minutes away. Saintes is about 30 minutes away and offers plenty of culture for the beach weary, boasting Roman remains and an amphitheatre. There’s also the opportunity of riverside lunches and boat trips. Bordeaux is within easy reach (90mins) and there are several beautiful islands to see, including the picture postcard Isle De Re (110mins). Outdoor patio dining is available at the front or rear of the property. Great property! Clean, functional and ideally situated. We thoroughly enjoyed our stay in the L'Ecurie Gite. Close to La Rochelle, Saintes and with quirky local villages on the doorstep we found plenty to do outside of the quiet location when needed. We had the benefit of meeting the owners, a super friendly family who ensured our stay was without issue. Managed locally, the friendly couple too were quick to respond to questions and more than happy to help out with minor issues which were quickly resolved. 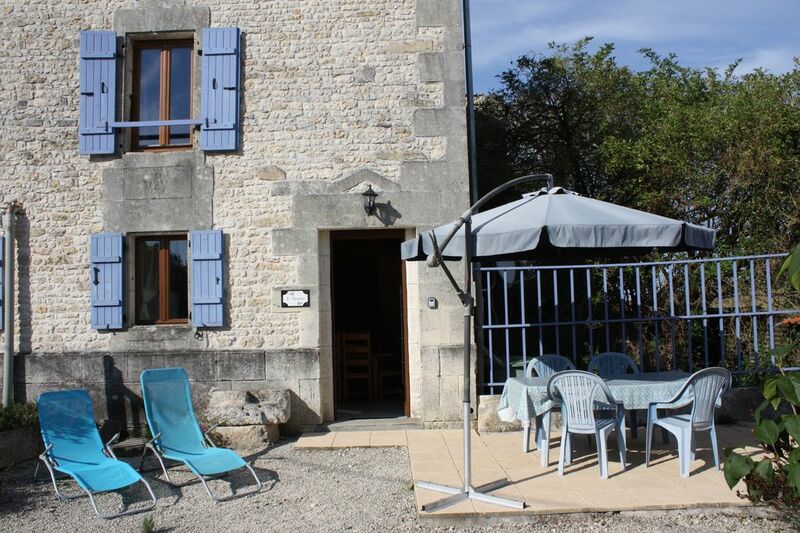 The Gite itself is well-equipped and offers 2 outside dining areas, one covered and the other with a view of the pool, both of which we found to be useful when we experienced some adverse weather. The interior is basic, but it works, is clean and of a good standard. The pool is well kept and a good size although there may be a requirement for more poolside furniture. I would visit this property again and the proximity to the other Gites means that it would work for two families of four should the property next door be available at the same time. 5 mins away is the village Loulay, which offers many amenities including a pharmacy, 2 boulangerie’s, a tobacconist and a co-op. Loulay is also home to the nearest bar, Les Moutons Noir, which provides everyday eating and a Friday music night (No food Sat or Sun day). In St-Jean D'Angély, only 10 mins away, you will find a tourist information centre, railway station, hospital, bars and restaurants. St-Jean is an historic market town, with a 12th century Abbey, beautiful lakes, and cobbled streets. There’s a tranquil boating lake, situated in a park with a childrens play area. There’s crazy golf, you can fish, hire a pedalo, kayak or canoe, or relax with a drink on an afternoon. Near the lake is Atlantys aquatic centre offering indoor swimming with water slide and baby pool. When the evening comes, why not enjoy a serene meal at a lake side restaurant. St Jean has a twice weekly market (Wed and Sat). There are shops, supermarkets, boulangerie’s, and even a go-karting track. Changeover is Saturday by 10.00am whenever possible to allow for cleaning etc before new guests arrive.